What would you do if you if you found a soulmate- but they weren't the same species? A fantastical Romeo and Juliet, of sorts but with fins versus lungs, rather than families. Just don't ask me what happened to her mask- maybe he can filter oxygen for her? (really I felt it took away from the stillness of the surprise of the intimacy). It's rather haunting, isn't it? The picture itself was inspired by the song 'Underwater' by Vertical Horizon, off the album 'Go'. It starts with this repeating of two notes on the guitar and the vocals before bleeding into the music equiviant of the water rushing by your ears. Or maybe I'm just nutters. 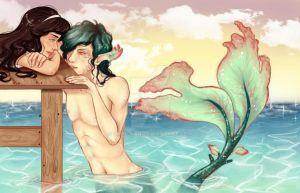 I've drawn mermen before (this is specifically based off two of my characters Falair and Mela), even underwater- but never to this detail. I wanted to show this was more than half man/ half fish, so that's where the stripes, webbing and ears come into play. I also figured that if there was going to be less of a fish tail and more of a shark tail, allowing for more streamlining. The background crashed my computer 2 times. I really was working a bit too detailed. Wooooops. Full working time: 30-40 hours; Pilot fineliner, Wacom Tablet, Photoshop. 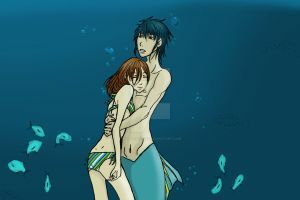 She won't need to breathe as long as the merman holds / embraces her. There is, I'm way too lazy to finish it. hmm, i think she dives there often and he watches her and now he got the courage to show himself!! I prefer the more fish-like merpeople, so this is cool. I like what you did with his details, especially the green on his fingers. That's something I don't think I've seen before - very cool. Her hair looks very nice too. Thank you! Come back soon- I'll be posting commission mermaid stuff, so more is on the way! the glossy shine reall fits his skin/her suit. the background is nicely done with the water surface visible, alas the computer crashed so often. I think this is lovely. Especially the look in her eye. One never sees enough woman/merman, it's traditionally just man/mermaid. Also, it's a relief to see someone else takse 30-40 hours to finish a detailed colour piece, too. So many people report that they finish a gorgeous digital painting in three hours. I was beginning to think there was something wrong with me. Nice work on him with his aquatic traits! Maybe he can transform her somehow...maybe enable her to breathe water and grow webs between her fingers and toes! Words cannot explain how cool I think this is. F*cking awesome. Hmmm... what happened to the other arms? Shhhhhh! Damnit, don't ask things like that! this is awesome! the renders are good, the anatomy's very good, and the colors are amazing! Wow!!! Just GREAT!!! I think this is the best of your artwork I had ever seen! Everything is just perfect - their expressions, their poses, the colors and the coloring, the shadows, the background, and espesially the light coming from above - everything is just great!!!! I absolutely like the tender passion in his gesture! I'll it! I had never heard the song, which inspired you, but I'll try to find it, I'm curious to hear it.